Your local skate shop is always on top of the latest products and has contributed enourmously to the local skate scene. Should you repay them by spending money on skate equipment in lame box-stores? Hell no. Every dollar you spend at the skate shop helps them stay in business. If those same dollars are spent in a sporting goods store, that takes needed income from the core of skateboarding. Are you stoked when you see a stack of basketballs in a sporting goods store? 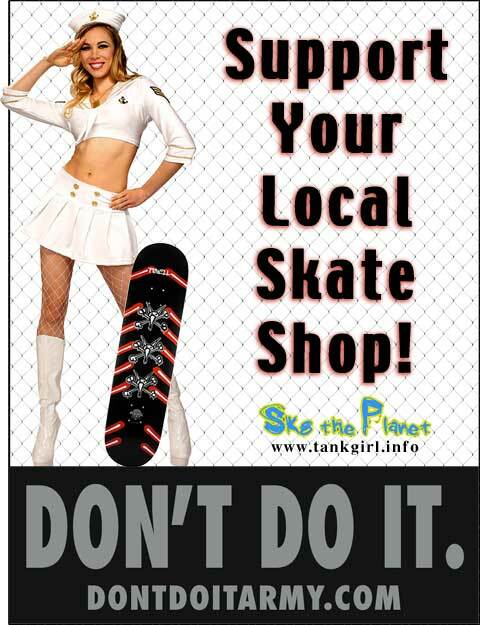 What about your local skate shop? Every time I go to mine, I get stoked to skate. They carry top quality and they tell me about upcoming products and events. I run into friends there and find out about the local scene. Sporting goods stores have loitering policies to make sure you buy a football and then get the hell out of their store.